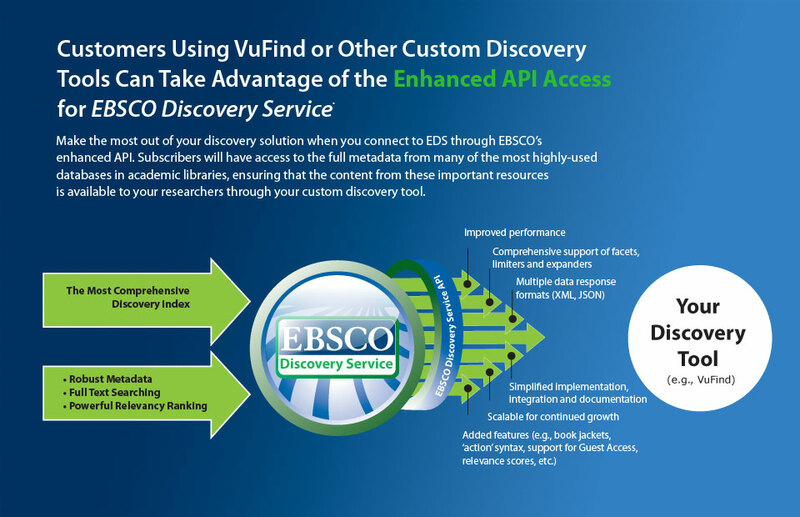 EBSCO Discovery Service API (EDS API) was created for libraries that want to use their own portals or website applications for their discovery service user interface while also providing researchers with the robust metadata, superior content and enhanced search features from EDS. With EDS API, libraries can integrate critical components of EDS into their library solution including rich metadata, superior relevancy ranking, full-text linking, (including SmartLinks), persistent links, custom links, facets, limiters and expanders, and book jacket images. By utilizing EDS API libraries also gain access to critical subject indexes via Platform Blending which combines rich metadata with subject indexing and abstracts from leading subject indexes that aren’t available through any other discovery service. While EBSCO has long provided open APIs for its products, the company was determined to build a superior, state-of-the-art API for EDS and created EDS API from the ground up. EBSCO’s goal was to create an API with simplicity in mind. In order to offer an easy, simple integration for API consumers, EBSCO designed EDS API to allow for integration with the most popular systems such as VuFind, Drupal, etc. In addition, EDS API provides comprehensive developer documentation and support including XSD (XML Schema Definition), sample XSLTs, VuFind demo as well as sample applications and code. When creating the API, EBSCO also wanted to enable libraries to create their own user interface experience. EDS API delivers this experience with expanded web service interfaces (SOAP and REST) and improved response formats (XML and JSON) that enable programmers to easily reproduce the EDS result list and detailed record exactly as seen in EDS or to customize the display to fit the interface.